We've talked about this in the past; but due to recent experience- doing a current repair in the shop on this skiff- I have some more remarks on the building method that is the subject of the post. I am unwilling to name the boat builder/manufacturing firm because I don't want the Forum to take a stance against these boats. I don't own the boat in question, I'm simply doing repair and modification work for friends who don't weld. The subject of the post is: slotted chine extrusions (or sheer extrusions, or other dedicated purpose extrusions) that are not fully welded both sides, in and out, where the plate/sheet is inserted into the extrusions. The practice involves a boat manufacturer who has designed an extrusion or set of extrusions to facilitate the construction process and in many cases end up with a very strong added thickness to major hull seams like chines and sheer seams. The extrusions I'm discussing are those with slots for bottom and topsides where the two sheet/plate edges are inserted into the extrusion and not welded outside the hull- in order -apparently to avoid the weld's appearance? The boat has a narrow gap between the topsides the chine extrusion slot- and that seam is not welded - the welds appear to be inside the hull- ONLy....!!! We've discussed corrosion cells, thin films of water left in between two pieces of aluminum experiencing a ph shift and that begins a corrosion cell- and that shows up as various 'symptoms' of corrosion. White Flowers, chalky powder or grey paste if wet, and generally the parent metal surfaces show coloration other than dull gray. This name brand production boat has corrosion inside the chine seams and under the top gunwale cap- an extrusion that is not welded to the topsides outside the hull! This boat is only a few years old and the welding in many places is NOt exactly highest quality. There is wide use of Bondo over weld seams at the helm station, the wind screen as these are both areas I've had to sand/buff/clean to fill old bolt holes or install replacement plates to fill equipment mounting penetrations that are now removed and being replaced. So, if you're considering a welded boat, and there are slotted extrusions used in the long hull seams - where the plate/sheet to extrusion seams are only sealed/welded inside the bilge/chine/under gunwale ??? You may want to consider asking for continuous seam welds ? OR consider looking for other builders who don't build-in this time bomb corrosion cell? in general, my 40 year old skiffs are in better shape than this few year old boat! Simple edge to edge seams with continuous inside and out side welds do not create corrosion cells or build in the exact geometry and structure needed to induce corrosion! Word to the cautious welded aluminum boat buyer! Last edited by kmorin on Wed Feb 21, 2018 11:33 pm, edited 1 time in total. To add to that Kevin the other issue to watch out for on boats built that way is the fact that the chine extrusions seem to be made of a slightly less noble alloy than the hull plating they are joining so they are particularly prone to galvanic pitting in the event that the owner does not have appropriate anodes firmly affixed to the hull of an even lower nobility than the extrusions. Interestingly, many of these boats came from the factory with zinc anodes attached which absolutely don't protect the boat as their galvanic makeup puts them equal to or slightly higher on the scale than the extrusions and in some cases even the hull plating. In other words the extrusions start acting as the anodes for the boat and the pitting focuses on those. The little aluminum anodes on the outboard motors initially attempt to carry the entire load but they get eaten up quickly as they are sized to protect just the motor as installed on a NON ALLOY boat. I see this situation in the shop all the time. That said some worst offender builders have recently switched over to installing mil-spec aluminum anodes on their boats, but not all. Any chance you could draw a simple diagram of what you're referring? I'm trying to picture the joint you're describing. Also, I sent you a private message on this site. Did you receive it? Many thanks from a new metal boat owner. OceanTrvlr sorry not to see the PM, just replied this am (my time) and will pay more attention to that feature of the site going forward. I'll try to get a sketch of what I'm discussing posted soon. One aspect of this topic of crevice corrosion that may be helpful is to use the Archive/Search function and try to find the past corrosion discussions/threads we've held here? The reason to suggest this reading is the topic is non-trivial in breadth with three types of corrosion (all related at a molecular level) and their various conditions, causes and cures- make any illustration less effective without the background knowledge. Also the online wiki's offer good articles on crevice corrosion cells and the chemistry behind their formation and performance. Chaps, I had a short discussion about this topic with a friend who said he had one-on-one info about some of the alloys of the extrusions? His report was that the complexity of the shape of the extrusions- had caused some builders to ask for other than 6061-T6 extrusions? The reasoning he offered (was attributed to a builder who uses these extrusions) was the need for increased malleability installing without rolling or forming the extrusions. If the temper or alloy were shifted from 6061 -T6 there is a good possibility the corrosion resistance of that alloy is compromised- maybe this is why you're seeing galvanic deterioration? So far, on the boat I'm remodeling the issue is the crevice/cup/slot/recess with the sheet edge and the corrosion coming out looks like regular white chalky powder - this boat is supposed to have been exclusively in fresh water? Cheers, illustrations coming; but not in the next few days! Just like Yelp, i think it would be best if you did mention the make. Your description paints a perfect picture i can clearly envision it. But as boat builders, we are all aware that submitting our product to the public eye (consumer) yields scrutiny. Perhaps this was a one off mistake on the builders part, in which case they can post a reply. But i feel that would be better than being in suspense aout a very major issue. I'll provide an illustration of the condition or building technique and I'll show why I can't support the decision to build with this technique but the AAB.com welcomes all posters who're interested in good practices designing and building welded aluminum boats. So, not having anything like a list of all those builders who use this design/fabrication/assembly technique... I'd be slamming (the site would get credit for hosting my loudmouth posts!!) a builder without being able to list the others who use this technique. I'm against the technique but don't know the builders- I'm assuming they're good people and believe they're building responsibly? So no names- anyone reading can see this condition on anyone's boat and make their own decisions but I'm not willing to single out one builder based on my one example of their hull that I'm working on- AND..... I'm not working on hull seam deterioration just cleaning up some old bracket bolt holes, and adding some Yukon River hunt features to help the owner make the 1200 mile roundtrip next fall. I understand the idea of putting your work out for critique in the market place but I don't think Welder offered us all 'his digital barn' to single out one company's decisions? I'm offering an educational thread to the entire readership- not attempting to "name names" or slam one specific builder- especially as I've never met or discussed this item with them. I use colored blocks to suggest different pieces as 'all gray aluminum' images are confusing. I had to make the 'slot' for the topsides and bottom big enough to see the leak path for corrosion cells to form. The idea is all that is presented, the actual extrusions are likely owned by each and every builder who uses this building technique. There are serious advantages that need to be noted: A) the chine mass or the amount of metal at the chine is seriously increased so these chines resist impact very well. B) the speed of building is increased as the side to bottom seam is a bit faster to fit- and tack- the welding is only two seams (inside) so an inside outside seam chine where the two panels meet is the same 'work' of welding. C) the appearance of the final chine is higher than if the companies had more expensively skilled welders to do this weld- they're able to use lower skilled welders and welding equipment that is different than might be expected if this hull seam were build differently. This helps keep already high costs -lower than they'd be without these various "savings"
This sketch is an approximation not a machine drawing taken from dimensions of a chine extrusion and has now real proportion- all done by eye to show the lack of outside welds and the corrosion cell sites formed by this technique. I've found this extrusion has chalky white flower along the outer upper edge and I think that is because it can't drain like the lower seam's outside edge can- when out of the water? The boat's topsides paint has all begun to lift along this edge of the topsides panels nearest this upper, outside seam's unwelded openings. If you see a boat built with this type of 'open chine' or unwelded extrusion seams- I think that the builder may have built in a 'time bomb' where corrosion in this socket to hold the topsides - will induce corrosion between the topsides and the extrusion's inner walls. My nature wants me to name names because this is the most common method of chine construction on what I call cookie-cutter skiffs, and it's a very bad idea! I'll go with what Kevin suggests, for his intelligent reasons, for now. Why even do this? Because it's attractive, protective of impact and most importantly, easy. When one gets to see what's below decks on these skiffs in terms of welding quality, it can be (but not always) horrifying. It's all price point that determines such things. It's rather a testimony to how strong even bad welds can be. Now throw in the 'Hewe's' (and others) foam problem and you get the idea. I name Hewe's here because you can just Google it and read all you want to about that particular. Again, that problem is all price point: making a real water-tight deck (and given the design style, wouldn't be self-bailing anyway) is expensive and what they do works - until it doesn't. Literally thousands of people pack around hundreds of pounds of water that they don't even know about if they haven't taken the precautions to prevent it from happening. The good news is that most people with these sorts of skiffs don't leave them in the water year round. But when they do, it ain't pretty. I'm wondering if these extrusions aren't 6063? They COULD be made of 5356 but again, that would add cost. One more thing: Kevin, how do you go about the repair? I've always turned it away, period. I didn't try to repair the chine to topsides seam- the project I had was add-on's almost exclusively. So none of this repair involved the chines' seams- or the sheer's very heavy extrusion that was welded on the top/gunwale/guard deck but not under the topsides or lower edge. If I were trying to recover this skiff with this type of extrusion- i'd propose to put a TIG bead along the upper chine extrusion edge and the topside plate/sheet - to seal in the corrosion that was happening? I don't think flushing an etchant solution or flushing with power washing would do much to actually clean the slot of problems... but then I don't actually know that. Perhaps baking soda (base to neutralize acid) and water mixed might be injected into the slot and then blown out with air- wire brushed and then TIG welded? Don't know from experience so all speculation. I agree that price point is driving this series of ideas, like foam-in-voids, and think the idea is equally ill-thought about the outcome over longer time frames. But, since the market wants to buy skiffs for less - price point is a huge driving factor. Unfortunately, at least in my view, this is short term thinking. I know what shape some of my 40year old skiff are in- pristine. And I got to see up close and personal what shape this skiff is in after a few years- not the best! So I'll stick with my policy of welding chines edge-to-edge (don't mind adding extrusions OVER the seams of edge-joined sheets) and expecting the boat to last more than its feeble builder's life time. Hope the illustration helps others to understand the issues being discussed and to give pause if your builder proposes this design feature? Yofish, I don't think that anyone would use 6063 underwater- even fresh water. The copper component of that alloy will interact with the parent metal and 6063 will 'eat itself' if underwater. I do think some of the chine extrusions may not be 6061-T6 but don't imagine anyone would use 6063 due to the copper in that alloy. I bought some unlabeled 6063 pipe once, I was assured it was 6061... mistakenly: and used it for underwater elements in a skiff! The (ripped lengthwise) half pipes literally 'ate out' and had to be replaced. Just got an email from a friend who's been in this discussion of slotted chine boats and he's made a suggestion that may be worth "all the tea in China?" BoeShield T-90 (https://boeshield.com/) and ACF-50 (http://learchem.com/products/acf-50.html) could both be injected/wetted/flooded into these slotted chine extrusions and likely- arrest the corrosion that they seem to promote!! These are both high tech (read expensive) "oils" that permeate aluminum corrosion cells by various degrees of capillary action - wicking into the metal to Al3 or other compounds' layer or interface boundary !!! That implies that any corrosion that is underway would be stopped- any that is not formed would be denied access to the aluminum of the extrusion OR the topsides and last, if this treatment were renewed every year or so (reading the directions) its possible the flaw in this design may be overcome by these aircraft industry problem solving chemicals? If I had a skiff worth the money they cost today, and it was built with open top, unwelded chine extrusions outside the hull?? I'd be "oiling" my chines! Just a thought that you may want to explore- find the links, read them yourself- its not my boat!! Then maybe experiment with a small volume purchase. Set up a corrosion cell- not hard to do! And test this 'stuff' to see if you can arrest the corrosion- then flood your open chines and relax- you don't own a 10 year shelf life boat- you own a much longer life boat!! I'll be working on a boat this week with the style of chine that Kevin has been talking about except the issue in this case is what happens when the extrusion is attacked galvanically on its exposed surface. In this situation the problem came about due to improper hull anodes originally fitted by the factory and the attachment of stainless steel trim tabs on an unpainted boat that was moored in salt water for several weeks. This boat may very well also have issues with crevice corrosion deep in the chine slots that Kevin has cited. The anodes that the factory put on this boat are made out of zinc and they show no deterioration because zinc is slightly higher on the nobiity chart than whatever aluminum alloy the chine extrusions are made of. Since the chine extrusions are low man on the galvanic totem pole on this boat they, in effect, became the sacrificial anode. The pitting damage was caused by the stainless steel trim tabs. The tabs are quite high on the galvanic scale and since they were attached to the aluminum hull and immersed in saltwater (an electrolytic solution) a battery was created with a massive amount of electrons flowing from whatever metal on the boat was willing to give them up (in this case the chines, the metal of lowest nobility) to the trim tabs. This has nothing to do with stray currents, a hot marina or anything other than two dissimilar metals physically attached to one another immersed in an electrolyte, a textbook example of a galvanic corrosion cell. 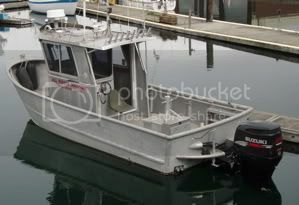 The remedy for this boat will consist of sandblasting and epoxy coating of the hull to electrically isolate it from the water, the fitting of hull anodes made out of an aluminum/iridium alloy that will be of lower nobility than any of the metals found on this boat so if there is any sacrificing to be done they will handle it and thirdly the trim tabs will get their own aluminum anodes so they will have something directly to chew on should they keep up their demand for more tasty aluminum electrons. The corrosion pits on the chines will also be repaired but that is secondary to eliminating the cause of the damage. Chaps, very well written review of the circumstance. Why this bit of physics is so elusive to builders, designers and architects remains elusive to ME!!! I guess not many of them have spent time "walking in our shop boots"?? A note: I'm beginning to suspect the alloy spec on these extrusions is suspect. I believe from the evidence (usually visual) that the QA of some of these alloys is #1. not what is specified? or #2. the buyer doesn't specify a stable alloy - so they may spec out 6063 with its high copper content? or the extrusion is some other alloy that is not stable (as noble in alloy as either 5086 or 6061) as other regularly used alloys? Now, 6061 can be temperamental under water - I've seen four of five angle extrusions age just fine but one will show pitting. On the other hand I've had some very (VERY) poor results using tread plate (6061 supposedly T6) embossed (diamond tread) plate as a skiff bottom. Some were very brittle (not all showed this property) and some just pitted to beat the band!!! So, my remarks are all speculation about the composition of the alloy of these extrusions, not definitive. But you just have to wonder how all the other alloys behaved? If one specialty extrusion pits while other underwater alloys were stable? - then what exactly about that particular metal was so compromised? Anyway, I'll keep with my old-school practice of joining 50 series to 50 series with a weld and hope that the alloy I'm supplied matches the MTR's (hopefully people ask for Mill Test Reports?) that are such a pain in the stern to obtain!! I see the pitting as you're observing it. I wonder if the effect is opposite of your observation? I see a TIG weld aft the topsides to chine and wonder if THAT was high enough heat to affect the extrusions' properties... but... the MIG weld inside the chines' was NOT? What I'm driving at is the idea that the amount of heat added by TIG welding, being very high compared to MIG, - that the TIG weld induced some alloy (property) shift that the rest of the alloy didn't undergo? Yes, the pitting is more obvious closer to the SS trim tabs... and the tail end of the chine extrusion shows little (no obvious) pitting.... BUTTTT, the TIG heat to fuse that large cross section extrusion was considerably more than the MIG inside as a 'lap joint'. So, what if the extrusion is being "heat treated" by the arc's heat of fusion? No experimentation or references to this but... the photo evidence does raise some questions. Wish we had some metallurgical engineering posters here who were knowledgeable on this level of chemistry!! Thanks for the photo image, sure confirms the question that should be asked by our Forum of all builders: What is the metallurgy of the chines on your boat? & What is your practice about welding all hull seams inside and out? Chaps, looking at the topsides in your posted pic about the chine pitting (just above of the older project) makes me think there may have been more serious corrosion issues on that particular boat? In the first chine pic (several posts above) the corrosion excavation seems confined to the chine extrusion? But in this one, just above, the topsides are pitted pretty dramatically too? So while the first example is likely a galvanic cell with un-passivated SS tabs, the second one makes me think there was a wiring problem? or something like copper bottom paint on that boat below the waterline? There are probably much better guesses than mine, but the topsides do make me think hard about the cause - as it relates to the chines' pitting as well. I checked with a very reliable Metal Supplier today with years and years of aluminum sales and his only remark was that some of the builders may use smaller mill/extruder plants to produce these various proprietary chine and sheer extrusions (?) IF that were the case- getting MTR's might not be standard practice so.... slightly off spec billets for extruding may be passed over in QA and get through to become products that are below spec? 6063 is only a few percentage alloy away from 6061 (still not THE best underwater) and the higher copper content will surely get those extrusions 'gone' in short order! My friend, the local metal supplier, reminded me of a couple of shipments of pipe- many years ago- that were not 6061 but were inked with mill stamps indicating they were. We got some of those pipes and had severe corrosion problems with some of the lengths. Other lengths, from the same order, are still in service but that few sticks had to be replaced. Nothing definitive, would like to hear from an extrusion company rep about the variables involved? and that the hull was built with 5086-H116. The fix . . . Hull & corrosion pitting was sandblasted, filled & faired, epoxied & bottom painted. Trim tabs & hull equipped with adequate aluminum anodes. I happened to catch your post and surprisingly since owning my boat from day 1 I always wondered why the manufacturer did not weld the outside of the chines as described in your post. I have to wonder, I've see many popular brand boats (I own a North River) with that style of design. If I'm not mistaken even Black Dog and Pacific boats are built in similar fashion with the chine being exposed on the outside. Based on your post, I purchased some ACF50 to help fight the corrosion process when I begin using my boat in the salt. From your experience, if I were to trailer my boat to the salt and not moor it, how long before you think this becomes a corrosion issue? Sides are 5052 and bottom is 5086. Not sure what the chines are made from. Maybe other North River owners can chime in if they've had crevice corrosion issues at the chine. I did notice that newer North River have the exterior welded on the topside where the chine meets both the gunnel and bottom but the bottom remains open as shown in the last picture. Hope this doesn't become an issue. Hopefully immediately rinsing with soap, water, acf50 and salt away immediately after salt use will help keep the corrosion at bay well into the future. I have found that most manufacturers weld only the 2 inside "seams" of the chine, and leave the outside bare. They do this to save weld time. It irks me that they dont AT LEAST seal the chine with a marine grade sealant, because even after a good rinse down, some salt will remain in this area. Also, the chine is usually 6061 and the hull is usually 5052 or 5086, and the dissimilar alloy invites corrosion to some degree. Bottom line- ask your builder to weld it solid, or AT LEAST seal it with a proper adhesive type sealant to buy you some time. delta, alumino, I'm sure there is a good reason (good to the person making it) for not welding outside these chine/socket extrusions? I don't buy into that particular design element but then I'm NOT manufacturing boats and price point- a couple hours here and there are not critical to my work. In a manufacturing setting- perhaps they have the hours in a skiff down to minutes here and there- to make their margins? I've never been able to build more than a few of one skiff shape/design -they kept changing and so the while the basic hull remained, lots of details changed for the net skiffs I built. Therefore- I don't have real manufacturing experience- and cannot explain why something like this is built in? If welding time is so critical? I'd have expected more bent/braked parts in the bilges and structural framing? BUT... we can't see into the decision process of all the welded skiffs out there- so we're left to speculate about reasons for building decisions we might find questionable? I have no idea if one boat will be 'fine' and another corrode- my experience was with a boat that was showing some powdering and chalk at the chines and the same had lifted paint just under the gunwales' extrusion at the sheer. I don't know the conditions, don't know the use, and can't predict the life expectancy as I'm not experienced in these designs' life span- I've not followed any given boat with this design feature long enough to be able to reply with any intelligence. My point was just to make owners, here on the Forum, aware of the potential for crevice corrosion, and since I can't say what alloy the chine extrusions are? (you can probably ask your builder?) I can't make any alloy interaction predictions- we did mention that if they're 6063 then: !! there will be problems! Sorry not to be able to help beyond raising the awareness in general of potential problems- like those I saw in a set of extrusions very similar to those shown above. I'd say that if the hour or so it would take to weld these seams' lengths was so critical to the savings by the mfg. (?) Maybe they could ask if you wanted seams outside??? Say for example they might ask if you'd like to pony up another couple hundred bucks to pay for welding the hull COMPLETELY? Or "Did you want the regular model of welded boat where we don't weld thoroughly; two of the most important hull seams in the entire boat?" Last edited by kmorin on Thu May 03, 2018 2:20 am, edited 1 time in total.